VISALIA – Downtown Visalia’s most anticipated project is about to officially begin. Courthouse Square Ventures, LLC is expected to close escrow on the historic courthouse building at the corner of Court Street and Center Avenue on Aug. 1. In anticipation of closing the $2.3 million purchase of the former county courthouse building, the Tulare County Board of Supervisors approved signing off on the grant deed to the property and to any other documents needed to complete the sale. Just last month, Matt Ainley, lead developer of Courthouse Square Ventures, received his conditional use permit from the Visalia Planning Commission to operate a hotel in the former courthouse. 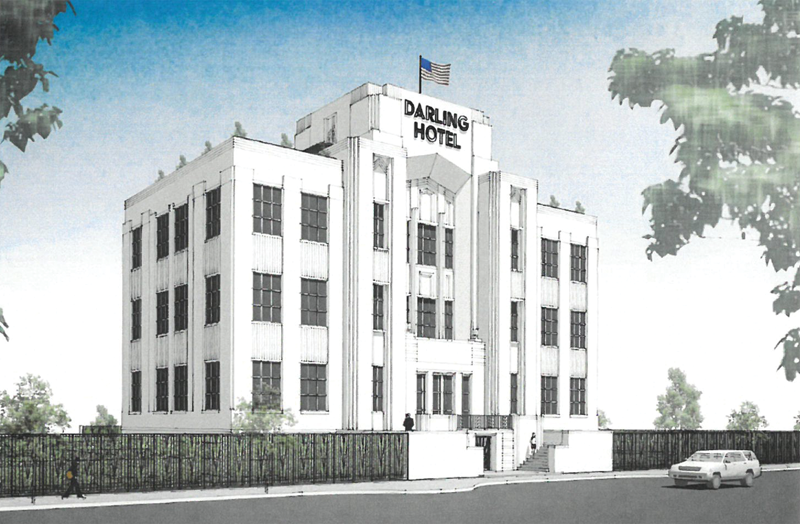 Ainley and his group plans to tastefully restore the classic art deco architectural style of the four-story building to pay homage to its 1930s roots. A pool and bar would cover 1,800 square feet of the rooftop with the other half being dedicated for a bar and lounge. The 28 rooms would be luxury suites between 275 and 500 square feet on the second through fourth floors. In addition to a grand lobby, the ground floor would feature a spa, wine cellar, two meeting rooms as well as 100-seat restaurant and lounge that will be open to the public. “I think this will be a cool amenity for the county and the downtown district,” Ainley told the Supervisors. The Tulare County Board of Supervisors unanimously approved the sale of the vacant four-story building on Court Street to Elderwood Capital LLC, a holding company for project developer Courthouse Square Ventures, at its Dec. 19 meeting. “Thanks for stepping up and taking on this task,” Supervisor Amy Shuklian said. The sale also included a parking lot at the northeast corner of Court and Oak and an annex building, at 100 E. Center Ave., that currently houses offices for the Tulare County Probation Department. Ainley said the single-story building could be a mixed-use project with retail or corporate office space or it could serve as a future hotel expansion, such as a conference space or event venue. He also presented renderings for the building to complement the hotel’s art deco architecture by adding large windows facing the street. At last week’s meeting, the Supervisors also approved a lease agreement with Ainley’s group to rent the 12,000 square feet of space in the annex building. The lease suggests the department will be there for at least another two years. The county will pay Courthouse Ventures $16,201.35 per month to rent the space for the Probation Department. The four-story building was constructed in 1935 as an expansion of the original County Courthouse built in the 1880s. The 22,300-square foot modern structure housed the County Board of Supervisors, Treasury, Auditor, Assessor and Purchasing departments until 1952 when it became the acting Courthouse after the original was damaged by an earthquake with an epicenter in Tehachapi. When the current Courthouse was constructed in 1958, the building was used for a variety of purposes but has been vacant since 2008.